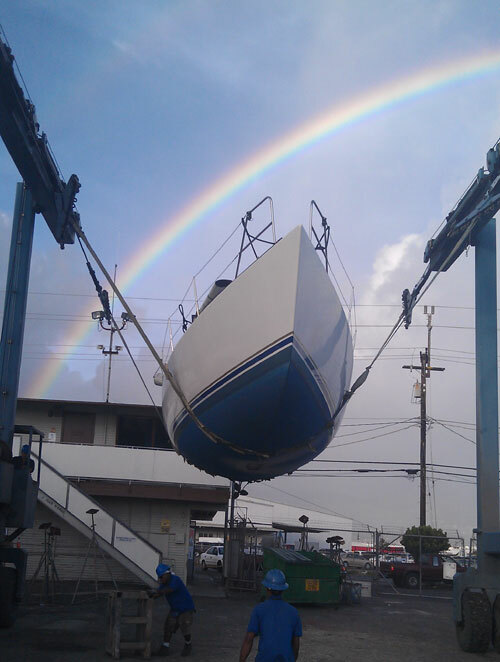 So a friend sent me this shot of our Hula Girl in Hawaii, keel off, ready to be shipped home after the race to the Islands. Looks like an auspicious sign for our turboed 50 footer. We are excited to report the the Girl is undergoing a full refit and will hit the water early next year shiny, clean, updated, faster, and sweeter than ever. What are the projects? Well, the BIG one is a new rig. After an extensive look at all the options around the world, we selected Hall Spars to build one of their beautiful grand-prix one piece (!) carbon masts. Not only do they turn our real works of art, but the team at Hall are great to deal with. With lots of assistance and input from some of the best-in-the business, we have also re-engineered the rig plan and are moving the chainplates back to sweep the spreaders about 12 degrees, making it a more stable, forgiving, and modern rig with less dependency on the checkstays. Man, it’s going to be sweet. Also on tap is a full new steering system, from pedestal, to idler blocks, to quadrant. Just to be sure. We’ll be replacing and/or rebuilding all the windows and hatches. We are getting rid of the aluminum toerail around the bow, and replacing the tracks aft. New deck hardware throughout. EVERY single piece of hardware is already off the boat, all the holes are being reamed out and filled with G10 rods, and the whole package will be re-bedded. And, of course, she is getting a full paint job. a nice and shiny better-than-new turboed Santa Cruz 50. I think we are going to need a bigger tree. J World chose KKMI in Richmond to oversee the refit. Not only are they renowned for their exceptional work, but they have also been the custodians of Hula Girl for… well, decades now, since before she was Gone With the Wind. 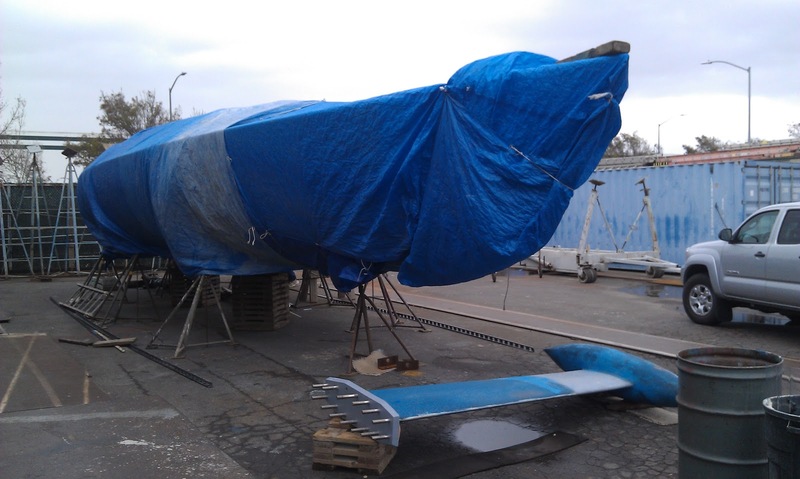 In fact, they oversaw the 2000 refit, including the installation of the strut/bulb keel, and the outfitting that Paul Cayard did when he owned the boat. Their staff have always been fantastically knowledgeable and helpful to us in many ways, so taking her to KKMI was pretty much the easiest decision… now what color do we paint her?? 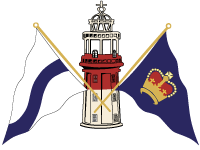 We are also thankful to a selection of sponsors and providers who are helping to outfit the Girl with the best marine equipment available anywhere in the world. Stay tuned for a full list as we update on the project progress. So the first outing for the newly gussied up Girl will be the 2013 Newport to Cabo Race in March. Due to a cancellation, we have a couple of berths still available (if you miss this, she is sold out for a while and the next opportunity to sail on her won’t be until 2014!). More info is here. Seriously. Get on this one. And in the meantime, all our classes are running full-tilt…. the season in Puerto Vallarta is kicking in, San Diego has been beautiful (as always), and despite the rain this week, San Francisco Bay has had a lot going on. Stay tuned for details on the So Cal Midwinters in our J/80s, our new Yachting Cup Clinic and Regatta, and more! Every two years, Newport Harbor Yacht Club hosts the classic West Coast sprint from California to the beautiful tropical wonderland and land’s end: Cabo San Lucas. This is offshore racing at its best. The event draws a great fleet each running, and we are proud to be heading down the coast in a true legend. Hula Girl, a turboed Santa Cruz 50, is renowned for her speed and many successes. 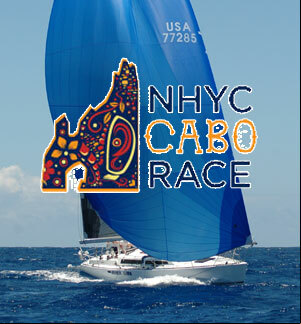 In the last running of the Cabo Race, a team comprised of three J World coaches and six clients placed third, and in March of 2013 we are looking to better that! This event was sold out six months ago, however a group cancellation has made some berths available. Contact us now to receive a Team brief and learn more about this fantastic opportunity.